I wanted to write this post yesterday but I had few errands to do in the afternoon and got lazy at night because playing with Baby Iqbal is so much fun! It's my favourite thing to do now since I've started working. 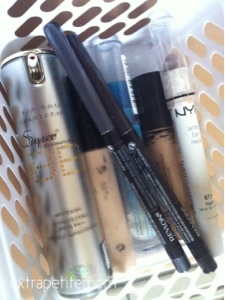 I have a small basket of makeup items I bring around the house in the morning. I can't do my makeup in our room because my baby is still sleeping so there's no light obviously. I either go to the toilet to do my makeup, my sister's room or my brother's room to apply my makeup. So there are some makeup items that have made a permanent resident in the basket. I have mentioned a couple of items in my January's favourites hence I'm going to write about the rest of them. 1. For base, I alternately use Skin79 Vip Gold BB cream and Max Factor Ageless Elixir Foundation. This is because they have lower SPF and both are moisturising (which is very important because of my air-conditioned working environment). 2. For eyes, everyday I would use Revlon Colorstay eyeliner in brown for upper lid and charcoal for lower lid. Why? Because it is easier to smudge my brown eyeliner with my cream eyeshadows. For eyeshadows, I would pick Essence (either Glammy Goes To or ) or NYX Jumbo in Yogurt. And for brows, I only use Essence brow gel and also eyeshadow base from Essence. 3. For face, I normally use Rimmel Stay Matte powder to set my make up and MAC powder foundation for touch up at noon before going back to work. I definitely have to blot before I put powder on my face. As for blush, I have been rotating them on a weekly basis and so far, I have use MAC Mineralised in Pet Me, Natural Collection in Pink Cloud and Rosey Cheeks (practically live in my makeup bag). 4. Lastly for lips, I have been liking MAC Syrup for almost everyday, occasionally Natural Collection in Rose bud (especially in the afternoon) and lately, NYX Round in Tea Rose. Not forgetting my lip balm from Maybelline Baby Lips in Berry before I wear my lipstick. What are your favourites for the past months? I'm sorry I did not get the pictures for all the products I have mentioned above. Insya Allah will try to update it.